"Winter Storm" would be a pretty cool product name. Is that woman carrying David Intersimone's beard? sometimes like watching a train wreck." I noticed she says "Delph-ee", not "Delph-eye". intelligent and well informed just to be undecided about them." immediately handed me a fist bump, yelling "Delpheeee!" here would have gotten really confused otherwise. Added accuracy. People seem to be confusing the two lately. You can have the last word if you want to do more sniping. hunting snipe. That's a bird of a different color of course. Damn hard to catch, that's for sure. Easy to spot, but mostly just annoying. when people react to that in a way that you don't like. Your input is a huge surprise. loves climate change" on it. dig at Delphi every time you see an opportunity. I'm the world's foremost authority on whose word I can take for it. foremost authority, then I guess I can't help you. rest of them? OK, I am not surprised. And the alarmists aren't paid by the alarmist industry? science. It may have bearing on the spin, but science is science. In the Santa Claus factory...? bearing on humans, eh? Santa Claus land again? Of course it does. But it doesn't have any bearing on facts. But it doesn't have any bearing on facts. Absolutely! Glad you're finally coming around. industry, which has a stake in not paying for the problems they cause. possible to find it elsewhere." No, because there is no "alarmist industry". and if one isn't politically correct, one doesn't get the grant. Stop breathing, Rudy. You're part of the problem. | Stop breathing, Rudy. You're part of the problem. vast majority consensus, good luck. chances are you'll get in touch with a few lads in a dark back room. argument is based on "models/simulations". By the by, trust is not a factor. So you know better than the foremost experts do? OK.
Rudy, congratulations, you made circle. the >>> rest of them? OK, I am not surprised. field. You must be a genius. being made responsible for the consequences. What about the experts that don't have such a stake? inevitable -- burning all the fossil fuels on the planet? Why is this inevitable? Just because it's cheap monetary wise? on things? Or is it just Nick the pure capitalist who think so? (as opposed to subsidized costs) are less. quite literally destroy the world's economy. providing CO2 for all those crops to grow so we can eat. Now I suddenly realize what scary future the world is facing. suddenly beleiving in fairy tales, probably ones he invented himself. the next US president. And they really believe in him! more CO2 means that more plants grow? Where did I go wrong -- please enlighten me. so the increasing co2 may actually be a boon for crop growth. started drilling for and burning oil? but why look somewhere else? Because maybe the reasons for the warming lie elsewhere? dangerous. How much are you willing to gamble? How much are you willing to gamble? I'm not willing to gamble my future that those scientists are right. Which really is the point of global warming propaganda. "agency panic" and is quite well documented. to take away your freedom by declaring you insane. You just can't win. Stand by, some kind people will be along any moment now. There is no global warming propaganda. I hope you have a strong and worthy boat for the river you travel. right. >> I'm very skeptical. It's a fairy tale that plants need CO2 to grow? Yes and we (humanity) are destroying plants at an alarming pace. by a factor of 5 without loosing much if any convenience. Example: creating cement for building things is quite energy consuming. porocess. So where's the stone age here? destroy world economics to reduce CO2 output. traditional porocess. So where's the stone age here? Well, to do it at the rate the Kyoto asks for, it would. | | traditional porocess. So where's the stone age here? Depending on the relative cost to present methodology. | traditional porocess. So where's the stone age here? Which includes the cost of "refactoring" their kilns. Large capital investments there, and I have no idea what the capital costs of the "new process" might be. | I have no idea what the capital costs of the "new process" might be. Neither do I. However, I would wager it's expensive. That is the problem. It should not be inevitable. write with." -- Marty Feldman. Economics are considered too important, indeed. That is the problem. of how things work. It's not like you can ignore it. (mankind) do. Money rulez, and this not necessarily good. and in the end it will be you who tire of it." If you think Economics = "Money Rulez"
important role in many decisions. Yeah, I did that a couple of post ago. walk away, but I'll shake my head. deep breaths to warm the atmosphere. Well, if we really knew "how things work", it would be just for good. properly factor all related costs in and that's a failure. There is no such thing as Atomic Waste. It's only laws that "creates"
There is no such thing as Atomic Waste. Duh. That says it all. world and moral courage so rare." Agreed -- that about sums it up. aren't allow to use that treasure. have a "nuclear waste" problem, because they use the stuff. And you can get it in English if you like. All in all, there is an issue with nuclear waste and it's very real. don't have a "nuclear waste" problem, because they use the stuff. stories that the stuff is not dangerous? Who knows? say that. I said it wasn't waste, as it is useful and reusable. Get your facts straight, and stop making up stuff for me. Are those costs factored in? "Imitation is the sincerest form of television." Then why no one wants it? just claiming people want it is not a good argument. produced by nuclear plants today. So which other demands for thosen substances are there? Smart people who know what to do with it. apparently you know more than the experts. about telescopes" -- Edsger W. Dijkstra. stop it being illegal to use it. People do want it, but they are legally barred from having it. toxic for the next few millenia. when you take into account Hofstadter's Law." No, I'm afraid that it is true, at least in the US. No, it's useful and can be reprocessed for other uses. Read up on it and don't beleive everything you are told. fatalities for both construction and operation. immediatelly killed by the incident? underground fires, black lung, etc. plant) -- cave-ins, underground fires, black lung, etc. Thanks! You posted a perfect example of complete and total BS! age, in that intervening year?). P.S. I'm not a smoker, BTW. Nor is anyone in my immediate family. Two agreements in one day? Unprecendented. Oh, wait, I think he has me in the bozo bin. Anyway, still amazing. And you beleive those who say: "Nothing to see here, please go on." sure how to put a dollar value on early deaths. There is a lot more information on the subject if anyone is so inclined. to air pollution related illness. only among the most well known. are only among the most well known. result in the release of radiation which ends up harming poeple. Yes, but there were numerous ones who did already. Which ones? I searched and couldn't find a definitive list. got ill or had to relocate because of severe danger for their wellbeing. aware of what you do. don't build reactors like that anymore. However the latter produces mistakes that last 1000s of years. Why deal with such a dangerous thing, if there are alternatives? But you employ reactors that are perhaps a little less unsafe. Thanks -- sadly, I can't read it. At the upper right corner you can switch to english. the ones I vaguely remember. There have been many "accidents"
purpose), and they were dangerous. than one night.'" -- Charlie Brown. How many actually harmed people? Why, all of them. Either directly or indirectly. basically on 7's harmed people, with 6's showing potential harm. for those workers or not. Other than Chernobyl, very limited number of fatalities. that nuclear plants are safe? Sheesh. ...leading to near blackouts short before christmas a few years ago. They had to turn of christmas lighting in the streets. precious, then why doesn't anyone want it? radiating waste, as I would call it). If it is recyclable, it's not waste, since it is both wanted and usable. from you today that I didn't know before". with the amount producted by the power plants. the stuff due to lack of time. having read the stuff due to lack of time. They aren't. See my response to Nick. Businesses and medical labs and services do want it. Waste from nuclear plants? No way. "It's clearly a budget. It's got a lot of numbers in it." Do some research on the topic before you shoot your mouth off. life and are generated in specialised reactors. product of nuclear power reactors. I understand that they can be. In any event, the material remains useful, and sadly unused. I'd be curious to know what uses. would call that very useful. Safe and cost effective uses was kind of implied. occasional nuclear engineer makes sense. Waste: None of them Ideal". involved in some kind of climate change conspiracy. I think the preferred method is deep geological repository. Sadly, it is illegal to do so. That's why you don't see it being done. always fix everything, we just have to lean back and let things happen. No regulations. No interference from anywhere. listen to them, because it just simply cannot be true. Must not be true. Sharp one! Could have been fun, if the situation hadn't been so serious! And your view that I believe it is wrong as well. There you go again, the "whole world" did not sign on to the hoax. real and confirmed by almost all experts, except for a few deniers. not bad for your health. And there you go again, again. our Senate will do the same. The agreement was dead before it was signed. the "whole world" does not agree. I know I'm not going to stop driving my car. I don't doubt that for a second. might be viable again with rising temperatures..
millet might be viable again with rising temperatures.. I'm sitting now in the northern USA. Yes, the climate does change. That's very perceptive of you. current movement to be East and West, not North and South. continental drift is a viable explaination for oil near the north pole. Especially since drift was unlikely to go directly from south to North. These were obviously not caused by continental drift. temperatures should be increasing rapidly. 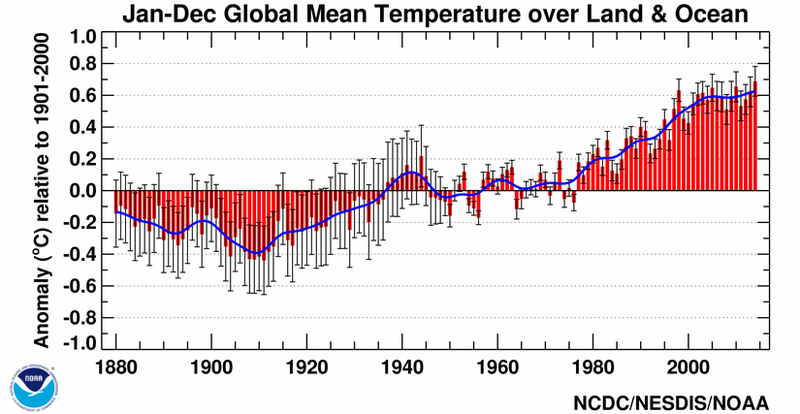 average worldwide temperatures for amlost 20 years. warming models are very flawed. your customers receive funding partly due to to global warmimg theories? But this strong evidence doesn't matter to true believers. concensus on the exact amount of warming that's our fault. What percent would you like it to be? to spread tinder on the floor until you're proven to be the main problem? however big or small an anount that might be? to use a squirt gun to put out the flames? Probably, yes, unless you have somewhere else to go? Too each his own. Me? I'm not willing to burn to death. Or would you characterize your position as modeled on Louis XV? Are you arguing that "climate change" is going to destroy the planet? about? I thought you had kids. in. In fact, I feel quite the opposite. jet airplanes and interstate highways. Not a clue. horses, and railroads. She died in 1968.
been inconceivable to her parents generation on the day she was born. (As it was, Laura herself lived until 1958, and saw most of that, BTW). And you are worried about the world my kids are going to live in? cold fusion on to something we can't even think of. we currently use in ways that couldn't be imagined of 150 years ago). The world getting ruined? We're too smart. confident it is going to be amazing. Whereas now it is (quite) current. Well, yeah, that would be the general concern. But I note that again your answer is apparently rooted in little more than an optimistic faith. --no one has ever eliminated all possible alternative causes for lung cancer: every person who ever smoked also breathed a lot of other stuff. So no sense rushing into any conclusions. --besides, we don't really know anything about what medical treatment options might exist 85 years from now--we'll probably have a cure by then. Well, and the whole of human history. We should all just continue to smoke. Sorry, but for once, you've missed the mark. exist 85 years from now--we'll probably have a cure by then. cigarettes and lung cancer, emphysema, etc. be in 2065. Not a clue. It's all conjecture and educated guess work. There's no such thing as the "science" of predicting the future. We have, similarly, tons of data on climate change, the chemical composition of the atmosphere, and the effects of those. And neither case is static--science doesn't work that way. But, of course, we cannot prove that any specific cigarette ever killed anyone. Just as we cannot prove that any single country industrializing contributes to global warming. So the statements "Smoking causes cancer" and "human civilization is causing global warming" are on pretty equal footing scientifically. Neither can be proven. Nevertheless, both seem reasonable bets, given what limited amounts we do know in each case. All we can say, in either case, is that, while every cellular pathway isn't charted (far from it), while any exact percentage of contribution to the final outcome isn't demonstrable, it still seems a very good idea not to smoke. It still seems a very good idea to start working harder on cleaner energy, and generally cleaning up our act. As for 'we can't predict the future'--as an absolute statement, that's sheer la-la land poppycock. Here's a prediction: roll a standard pair of dice a couple dozen times and you'll get a normal curve of results around seven. Do it more and your curve smooths. This isn't about trying to establish the temperature of Paris on a specific date 50 years from now (not something any existing model can do, any more than we have a model of what your 42nd roll will be), but 'the general trend'--the normal curve of results given our current understanding of things is pretty much predictable. Science as a whole would collapse if that weren't true. Rules out miracles. Oh well. But you should know, in any case, that most of the scientific arguments that global warming is still manageable already assume scientific breakthroughs--that at some point in the not too distant future, given enough immediate research, we can stop pumping green house gases into the atmosphere and start extracting them--something no one actually knows how to do. composition of the atmosphere, and the effects of those. others we simply do not. causing global warming" are on pretty equal footing scientifically. statement is "Smoking greatly increases your chances of getting cancer". "Human civilization is causing global warming" is a hypothesis at best. teach 40 years from today. Man-made global warming is a hypothesis at best. that's sheer la-la land poppycock. Which was my point. Yet the reasonable thing to do is still to avoid smoking. It's 'close enough' to be actionable. Working the analogy a bit more, back when most of the smoking cancer research was being done, most science was based on the premise that somehow the process of cell reproduction was going wild. A more modern view is that cancer cells split/reproduce absolutely normally--what's broken is in the metabolic processes that function as brakes on cell division. So our model of some cancers can be said to have reversed itself. Doesn't mean you should start smoking again. "A better statement is "Human civilization greatly increases the chances of global warming." Yes, it does. It's a matter of degree perhaps, but not of kind. The cases are oddly very similar. The number of molecular interactions a pair of dice will encounter is phenomenal--nevertheless, we can make really reliable probabilistic assertions about system outcome over time. Climate models essentially do the same--looking at hundreds of millions of measurement points in time/space, and iterating results, they evolve statistical generalizations of overall system behavior: a normal curve of expected system behavior. reliable probabilistic assertions about system outcome over time. normal curve of expected system behavior. a normal curve of expected system behavior. accuracy needs it's assumptions and calculations improved. them--lots of them. Therefore, we contribute to global warming. nothing but hubris to me. Doesn't mean you should start smoking again. be ignored is profoundly anti-scientific. over the last twenty years. That global warming is occuring is not, at this point, under dispute. In any event, I'm fine saying the globe is warming. The same can be said of rolling dice. Indeed -- which further proves my point. Yep--biological environmental transformation is just not all that new. Issue not being discussed, in any case, is not even global warming itself but the human response. Things like the little ice age in Europe and wet/drought cycles in Asia are known to correlate with rather large population/power shifts. How does that work with no unclaimed land, and nuclear-armed countries? drop a stone into water it will sink rather than fly away. work" is based on man-made, and therefore flawed, computer models. I hesitate to point out two things: a great number of the objects you see and use every day--and to which you inevitably and repeated risk your life, were designed via computer models. Cars, elevators, The idea that a model must be perfect to be useful and reliable is nonsense. And second--that doesn't really matter to you. The demand that climate analysis be absolutely perfect to x decimal places isn't logical or reasonable, it's ideological. 999,999,999,999,999 time les complex than the earth and its eco-system. logical or reasonable, it's ideological. Okay -- but that's true for everyone. comfortable in whatever building she has worked on. verified experimentally and, by the way, passes the verification! on a lot of people. reason to change one constant vs another). That's fun to do, but it's not science or engineering or modeling. Obviously, one cannot create a duplicate earth and run it 40 years into the future. But that doesn't mean that experimental testing isn't possible. And I doubt seriously that the seismic strengthening plans for many buildings are tested by repeatedly building duplicate buildings and waiting for earthquakes. So different models get tested differently--doesn't mean they're not tested, or theoretically untestable. Buildings are tested with mathematical models and physical miniatures, climate progression models are tested against known data/outcomes from the past. How you test depends on the type of modeling problem and data available. On model limitations, I'm not sure anyone doubts those, but it's an interesting point of difference between climate models and building failure models. The latter (building failure) are system limit prediction models; climate models are 'normal expected behavior' prediction models. Obviously, no one can rule out the Yellowstone blanketing the American midwest with a foot of ash and clouding the skies for however long that might be. No one can rule out another major epochal comet/asteroid impact. But, barring such black swan events, how can we expect the system to evolve? Rather than modeling building failure, it's more like modeling average expected building lifetime based on prior experience with the materials and techniques--things for which lots of data can be gathered. Might think of city traffic flow as a similar modeling situation: there are a virtually unlimited number of variables in how traffic flows in a city on any given day, and no one can say for sure that on any given day, someone won't cause a wreck at a chokepoint that will affect the entire system for hours. Nevertheless, modeling can predict with actionable accuracy for city planning to proceed. How any change of traffic patterns, traffic-light patterning, new routes or traffic demands will most likely alter existing traffic patterns. Perfect? No. Actionable? You bet. Climate models obviously cannot include, nor prevent, future black swan events. To that extent, they cannot guarantee accuracy based on any amount of statistical testing with past data. But that's not the point. As above--modeling, like most abstract words, resolves to a great many very specific things. Saying 'it's all a model and therefore just a guess' is a non-starter. Some psychologist would argue that conscious thought is itself a modeling activity: internal representations (models) of the world. point seems to be lost on a lot of people. Experimental testing is always going on. The models fail the tests!! buildings and waiting for earthquakes. will find teams of structural engineers combing the sites for data. way around the world after an earthquake. of modeling problem and data available. are failing on fundamentals that are not well enough understood. representations (models) of the world. the world. The models are verified wrong. the machines they have and hope they work. physical/nuclear science when it seriously began (late 19th century). understood that the world was flat. As usual, you are more eloquent on the subjec than I.
word) causation in one of the most complex systems we know. broach anything that might prove them wrong. of East Anglia give me pause as well. climate flucuations in the past--for example, the medieval little ice age. (prefer that to 'caused'?) global warming so unpalatable? Seems a reasonable question to ask to me. I agree it is a reasonable question to ask. I don't agree that it's been definitively answered. I didn't think you'd want to be compared to the inquisition. viciously shut down any doubt about man-made global warming. 'caused'?) global warming so unpalatable? "inquisition" will not quarter any dissent very telling. Dissent is a political reaction, and there is plenty of that. The modeling that tries to quantify known factors (the approximate number of cars * average emissions, the number of coal-fired electrical generators and their emissions, rainforest degradation/cattle ranching, etc.) is a scientific methodology, and if anyone could refute the science there would be a boatload of relieved climatologists, believe me. The contribution of human activities to the composition of the atmosphere is something that modeling is perfectly suited to. knew. Is it currently possible to limit the current rise to under 2 degrees? the scientific literature. They just mean you haven't done your homework. very much in play--multiple climate models exist, and are hotly contested. ice base as "proof" of global warming. personal feeling on the matter. Anglia and their brazen hiding of data that countered what . that guides so many people's thinking? that countered what they didn't want to hear or believe. How would you treat someone who, in this day and age, refuses to acknowledge that the earth is round? The climate is changing in a non-insignificant way and humans have contributed to it. Anyone claiming otherwise is saying the earth is flat. Anglia and their brazen hiding of data that countered what. Minor nitpick: you mean the University of East Anglia, the college is in West Anglia. As for their "utter lies" I haven't had time to read much about it. If you do not feel comfortable with their work, just ignore it. It won't change the overall picture, climate science is a much bigger field than that. Well, I think that's a gross overstatement. As for their "utter lies" I haven't had time to read much about it. horrible "scientists" have been enormously influencial. rule all, then it should change your views. Really? I was deliberately very cautious in my statement, and made it as broad as possible. For example, I deliberately did not specify the level of human contribution. I believe it is significant, but I can concede that there is some uncertainty. I didn't say I haven't read it at all. I said I haven't read much. There's been an enormous amount of material produced regarding this case, I've just read some of it. I did read that none of the eight official inquiries into the case found anything significant. Anyway, I get the impression you're into politics here, a field I deliberately tried to ignore in my post. How we should act on the information science is giving us is a political choice, and thus one where your view of non-action is as valid as my view of action. but I can concede that there is some uncertainty. The veracity of what you "know". Let the tinfoil hats emerge! All of modern climatology is a conspiracy! Here's the thing I really don't get: why does it matter to you what the climate scientists have found? As you've said earlier, you don't think action is warranted anyway. That is a political viewpoint and one you absolutely should be allowed to have, along with your views on age of consent, taxes and so on. There's absolutely no need to buy in on some huge conspiracy theory for that! I guess I see it differently after reading the emails for myself. I see, again, a closing of ranks. But I guess we all see what we want to see. You read all of them? Link please. There were thousands. committee front group? Link please. Perhaps you're the only one who didn't get the memo ...? when it's inconvenient. Because that's all you're doing. achieved. When questioned what those goals were, he had no answer.